Provide comfort for the family of Theodore Boyer with a meaningful gesture of sympathy. With tremendous sorrow and saddened hearts we announce the passing of our beloved father, grandfather, uncle, friend and much respected elder of Mississauga First Nation. Teddy started his journey into the spirit world on January 23, 2019 and joins his cherished grandson Bruce Cada. Lovingly missed by Rosemary Morningstar. Forever loved father of Nanette Boyer (Rick Ferrigan), Ted Jr. “Mooney” and Kelly Ann Boyer. He leaves cherished memories to his grandchildren Ryne, Shania, Celine, Karissa, Jennah, Ricki-Lea, Macy Ann and Sophie. He leaves his sister Lyma Boissoneau, 3 generations of nieces and nephews and numerous friends. Very special friend of Willard Pine. Predeceased by his parents Pierre and Marcella Boyer (nee Simon) and siblings Bill, Stanley, Timothy, Clarence, Caroline Armstrong, Carmelita, Margaret, Peter and Garnet. His fur babies will miss him. 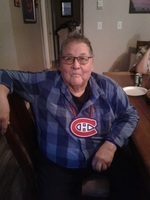 Teddy was a dedicated and loyal fan of the Montreal Canadiens. He was involved with his community, Mississauga First Nation for many years as both a men’s hockey and men’s and women’s baseball coach. His legacy includes coaching for both the Little NHL and the All Ontario Men’s Hockey and Fastball Tournaments. “He brought championship Nish hockey to our First Nation” - Roy Jackpine. As a younger man he was an excellent athlete and performed at a high level in all sports especially hockey, baseball and broom ball. He had a particular love for his fastball team the “Outlaws” where he was a great south paw pitcher. In his later years he was a big fan of local minor hockey and the Blind River Beavers. For many years he sat on The Mississauga First Nation Chief and Council as a councillor. A great man, well respected and known to many as Grandpa and Uncle. He will be forever missed, loved and in the hearts and on the minds of the many lives he’s touched. Each and everyone will have their own special memory to cherish. To plant a memorial tree in honor of Theodore Robert Boyer, please visit our Heartfelt Sympathies Store. Sorry for the Families and Community loss. A true Leader and Elder. Baa Maa Pii, Theodore Robert Boyer.